Despite his suspicions, Chief Powhatan helped the British settlers through their first winters. But the good relations did not last, and Powhatan was forced to fight. Fortunately for the English settlers, Powhatan had a plan. He regarded the English settlers suspiciously, as he had previously regarded Spanish settlers. But the English had guns and powder. These items might just give him the advantage he needed to defeat surrounding tribes. And the English seemed so harmless at first. If it were not for the good nature of Powhatan's people, the English settlers never would have survived their first few seasons in the New World. Good relations with these new inhabitants might help forge a powerful alliance. The Powhatan Confederacy comprised 30 tribes living along Virginia's coastal plain. Chief Wahunsonacock, called Powhatan by Captain John Smith, united the tribes to form the Powhatan Confederacy. At the time of Smith's appearance in Virginia, the Powhatans numbered about 12,000 people. Tribes of the Powhatan Confederacy are called Algonquian because their languages were based on a large Native American language group called Algonquin. Before long, Powhatan's hopes were dashed. During the "starving time," colonists took to raiding Native American food supplies. In retaliation, Powhatan ordered an attack. 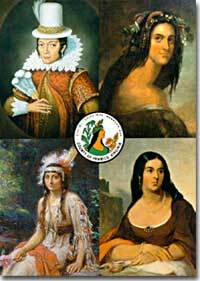 Pocahontas was the daughter of Chief Powhatan and wife of Jamestown settler John Rolfe. War raged on and off for the next few years with unspeakable brutality committed by both sides. Unsuspecting colonists were riddled with arrows. Children of defeated tribes were drowned in the James River. Finally, in 1614, Powhatan accepted peace with the English. His daughter Pocahontas, after being kidnapped and ransomed, was married to John Rolfe and taken to England. Unfortunately, she died of disease only three years later. 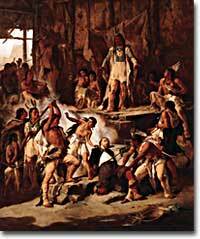 Powhatan died in despair in 1618. 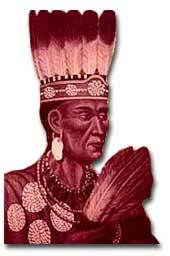 Powhatan's brother, Opechancanough, was determined to continue the fight. On Good Friday in 1622, he led an attack that nearly finished the Jamestown colony. Three hundred forty-seven settlers were killed before the situation stabilized. Fighting continued between the Algonquian peoples and the English until 1645. 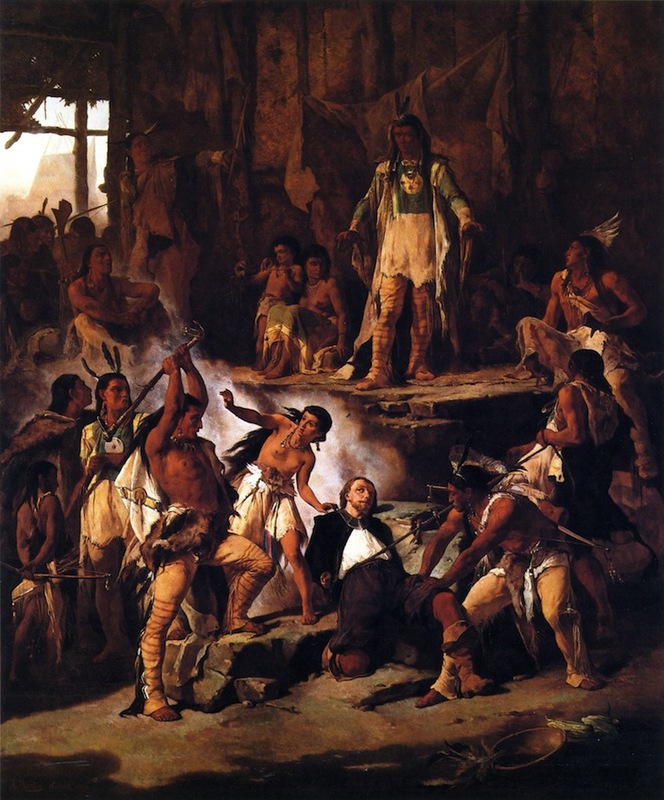 Opechancanough was captured and executed. The English forced the tribes of the warring confederacy to cede land and recognize English authority. As illustrated by Victor Nehlig's 1870 painting Pocahontas and John Smith, the story of Pocahontas was glorified not only in literature, but in historical painting as well. Many cultural differences separated the Native Americans and the colonists. The most important contrast was each side's differing view of land ownership. According to Powhatan's people, land was owned by no one; rather, it was collectively used by the tribe. Because land could not be owned, it could not be sold or yielded in treaty. Selling land was the equivalent of selling air. The English view of individual land ownership was completely foreign to the Powhatans, who could not understand being pushed off tribal lands so it could be sold to individuals. To the Powhatans, the loss of their land was a matter worth fighting for. Warfare and disease eliminated about 90% percent of the Native American population in Virginia within the first 60 years of English settlement. Maps, maps, and more maps! This page is not the most visually pleasing, but it contains several links to detailed maps. The first link leads to a full, elaborately illustrated map of Virginia drawn by Captain John Smith in 1612. It shows the locations of many Indian villages as well as the Jamestown settlement. The other links point to details on the same map. What did early Powhatans eat? How did they dress? What type of religion and government did they have? What about their marriage customs and family life? Here's an opportunity to learn about Powhatan history and culture from Powhatans themselves. The Powhatan Renape Nation presents this excellent website, which covers Powhatan heritage, history, preservation, and modern-day issues. 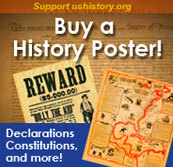 "Powhatan History" and "Pocahontas Myth" are two articles not to be missed. Written by Chief Roy Crazy Horse, they provide an insider's perspective and shed important light on misconceptions that have clouded Powhatan history. Images of Pocahontas vary as much as accounts of her life do. In some pictures, she is portrayed in Native American dress; in others, she is anglicized and costumed in formal British garb, complete with a stovepipe hat and lacy collar. This article by Smithsonian magazine presents commentary on one of the most famous Pocahontas images — a very British portrait that resides in the National Portrait Gallery. Find out just how accurate this portrait is and how it compares with Disney's artistic depiction of the Powhatan princess. Was Pocahontas really the sweet, heroic friend of Europeans as portrayed in Disney's 1995 animated film? Find out what a Powhatan chief has to say. Powhatan is an Algonquian word meaning "at the falls." Europeans first thought the Powhatan women farmed and built houses because the Powhatan men were lazy. An engraving of Pocahontas is the oldest piece in the National Portrait Gallery's collection, which includes over 18,000 items.